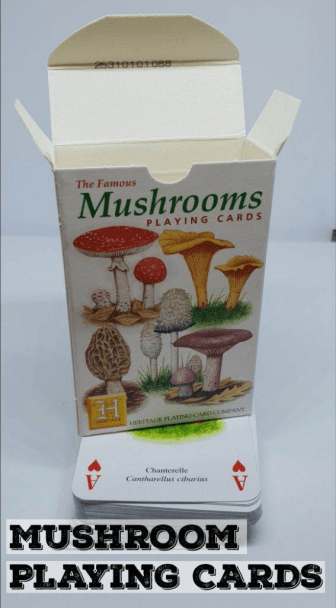 My old mushroom setup has fallen apart, I’m looking at scaling soon, but I am really limited on space. The only real space I’ve got is about the size of a cupboard in my shed. I can also grow outside, but that means taking my humidity operation and putting it outside. Not something I want to do and not something that I will be doing when I eventually do expand, though I may try some logs soon. 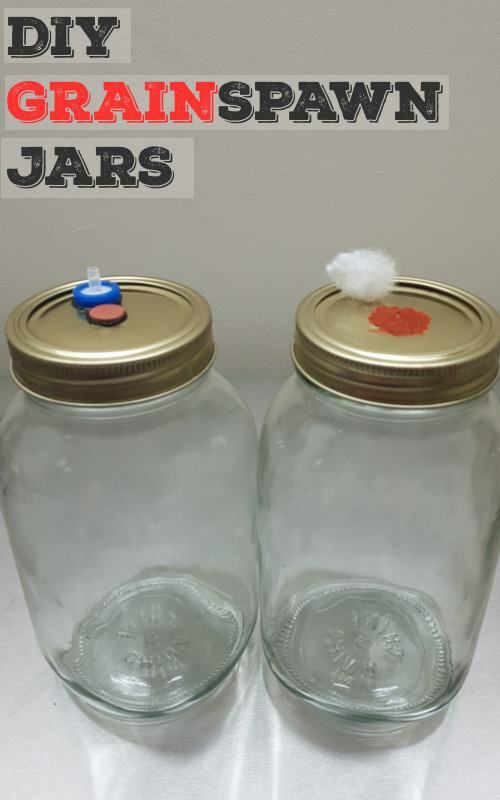 I’ll have a list at the bottom of this blog showing you everything you’ll need to make your own. 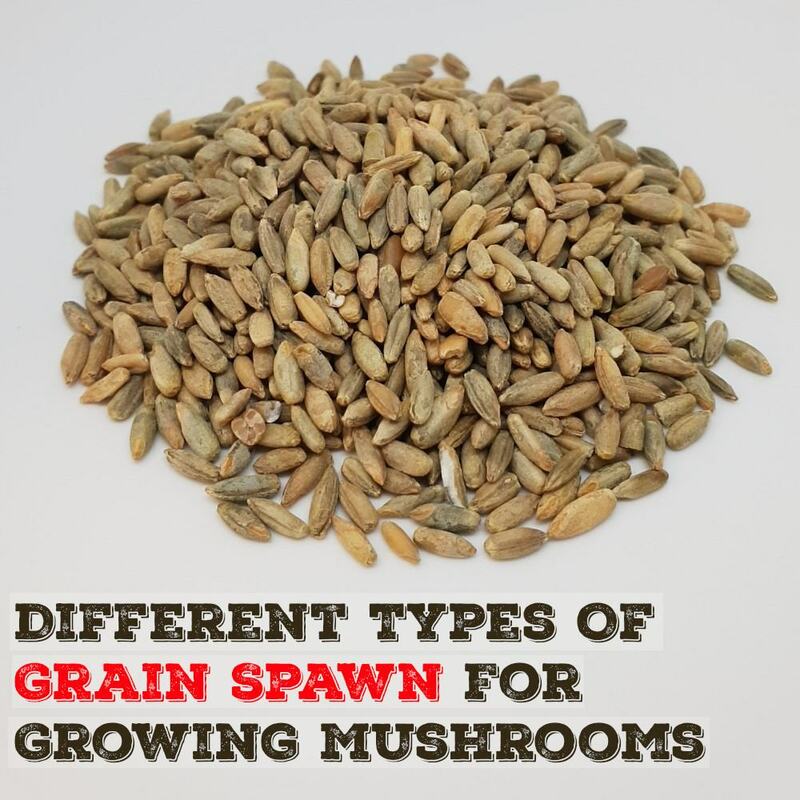 So, I need a new humidity setup for my fruiting chamber. A common theme seems to be ‘conditioning’ the air before it goes into your chamber. This, I guess, removes the need for multiple setups in your FC? I don’t know, but it seems like good advice. 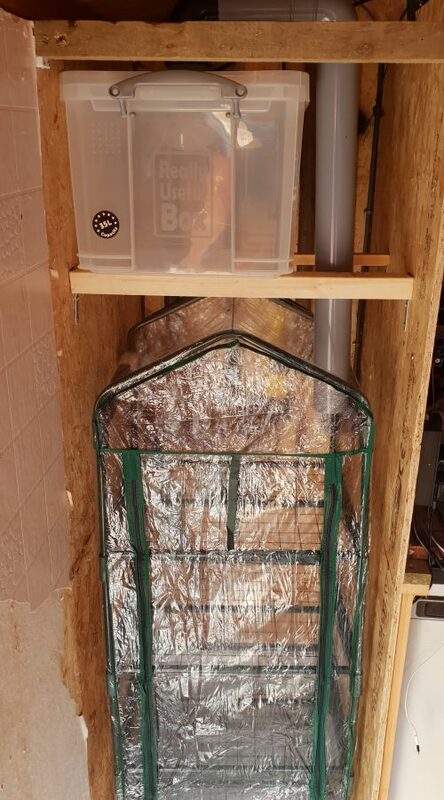 My current FC is a small greenhouse kit I purchased off Amazon here. It’s small enough for my shed although I wish it were one tier higher than it is. It’s not much, but its cheap and all I can have right now. So, for the humidity I went with a these ‘Trixie Fogger’ and from using it for the last few weeks, I’ve not had a problem. I’ve got it set up to go on and off 3 times a day at the minute until my Arduino project is all set up and working. 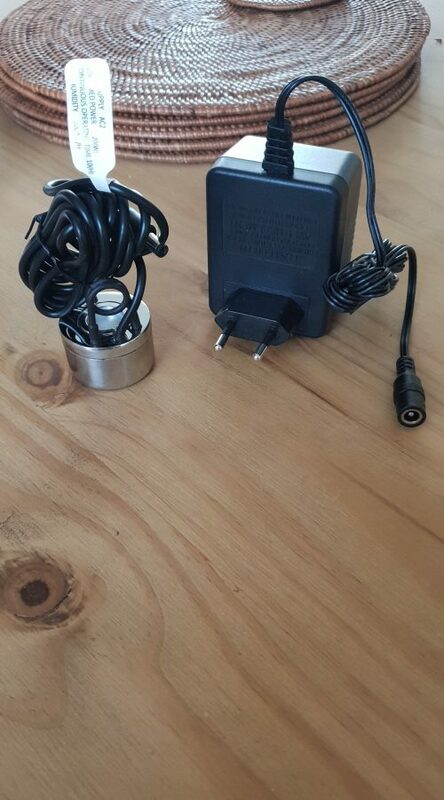 From what I can tell, this ‘Trixie Fogger’ is a similar size and output to the American company ‘House Of Hydro’ but I’ll let you know if I ever order one from there. Now, I challenge you to try to find a bucket on the high street tomorrow that also comes with a lid. You can get it online easily but, on the high street, I struggled to find a small one with a lid. 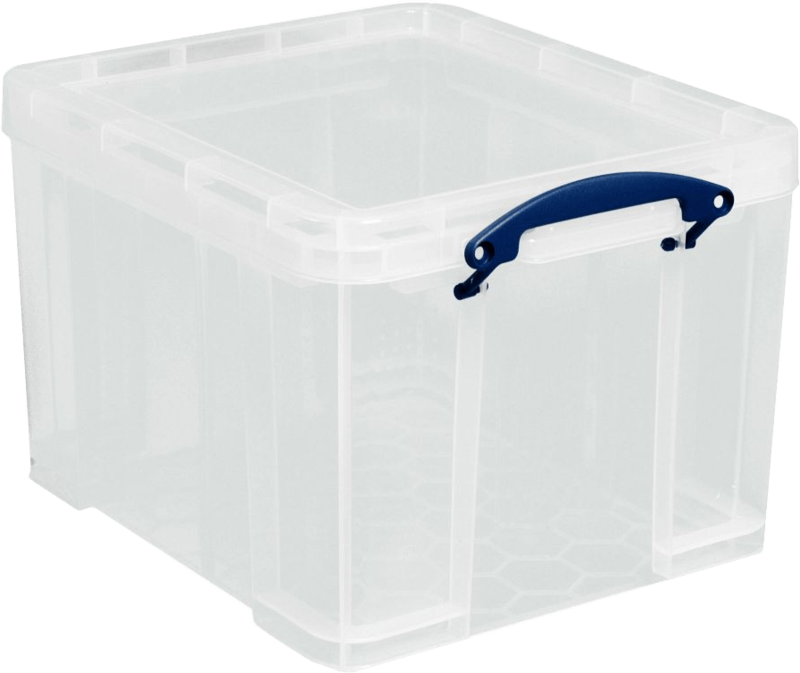 So, instead of a bucket, I went with a plastic box which are more common. 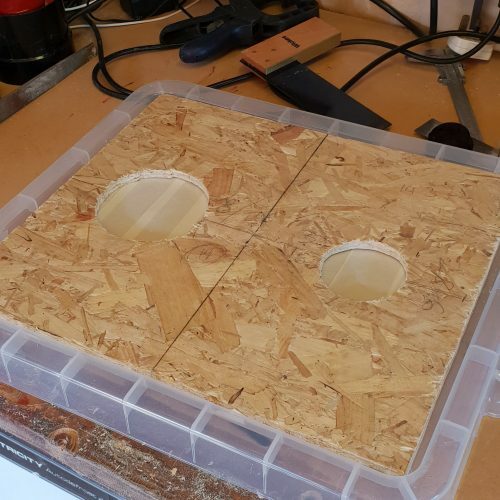 The box needs 3 holes cut into it. 2 in the lid and 1 for the cable. 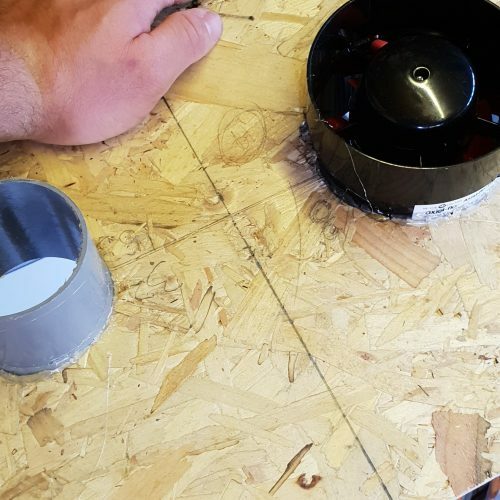 The two boxes in the lid are needed for the inlet ‘pusher’ fan and the outlet that leads to the FC. 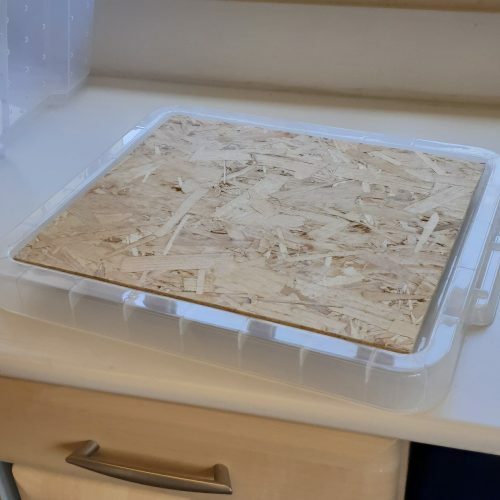 Plastic lids are very flimsy and prone to cracking, I’d advise you to use a wooden board on top to distribute the load evenly. 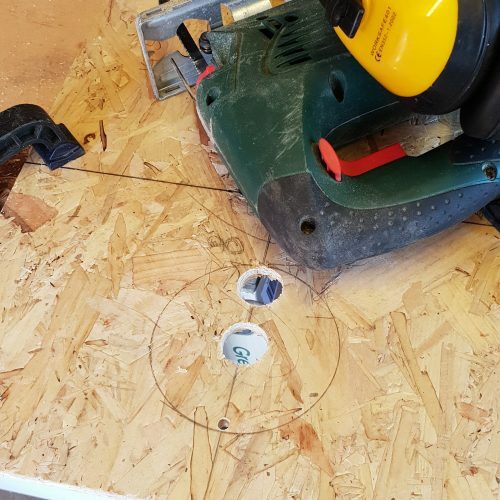 Find the centre and drill your pilot holes through your wood and lid. 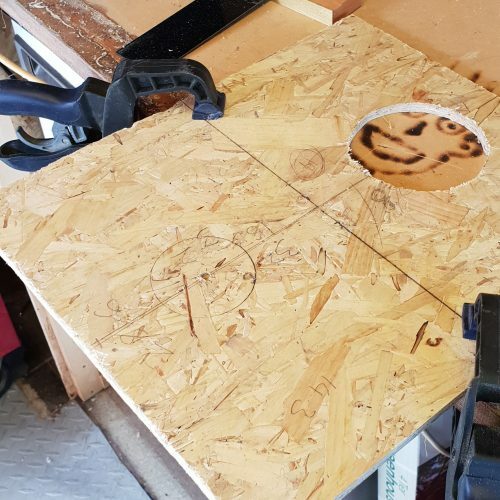 I cut my wood out using a jigsaw, but you could use a hole-saw if you have the right size for your fan and pipes. 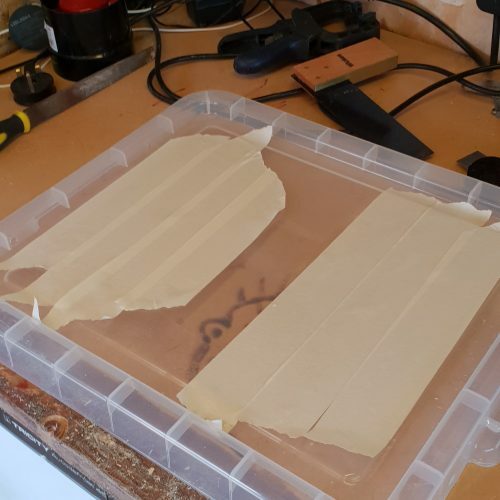 A piece of advice is to mask the plastic with masking tape to prevent excess scratching/pen stains and it helps with the cracking issue of the plastic. 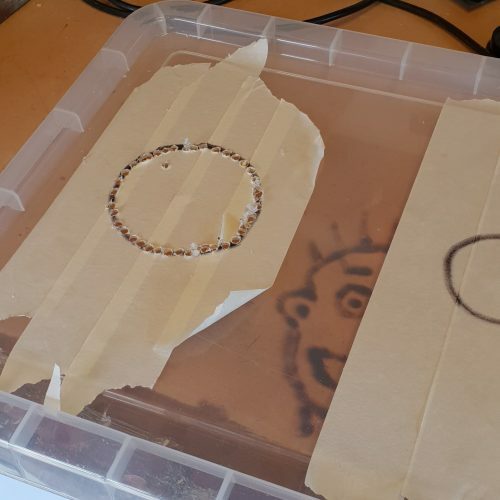 I drew a ‘circle’ using the wooden cut out as a template onto the plastic. And then drilled 30/40 holes around those circle marks. 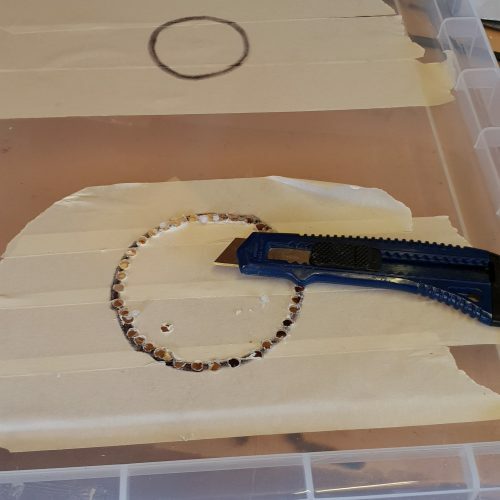 I then cut the plastic that was holding the circles together with a sharp Stanley knife. Be bloody careful here. You can use a chisel to make it safer. I then used a Dremal with an… orange attachment? grinding wheel thing, which was defiantly not meant to be used for that purpose. And the wooden board as a jig. To make sure my fans and pipe would fit. I then fixed the 100mm fan and drain pipe in position with hot glue. Then sealed it up to prevent leakage/losses in pressure with silicone. On the plastic lid I ran a big bead of silicone about 1cm from each hole around the circumference, this makes a more air tight seal preventing losses in pressure and moisture getting where it isn’t wanted. And that is it. I still have to dial it in and adjust the timing, but I’ll wait until I set my Arduino relay system up for the ‘dialling in’. 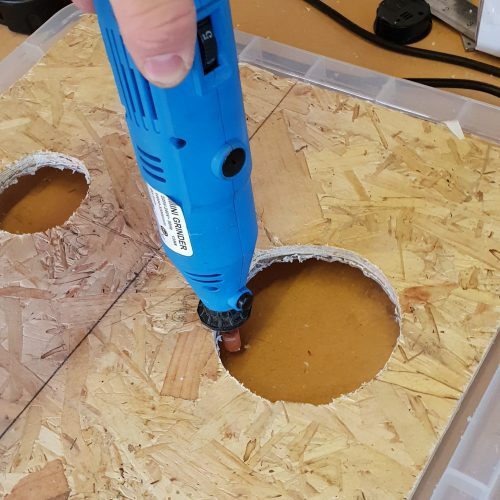 Obviously, the outlet could be very different to what you’ve got, but the setup is modifiable, all you’ll need is drainpipe and elbow joints and you can adjust the pipe to blow in whichever direction you want. This setup works perfectly for me right now. 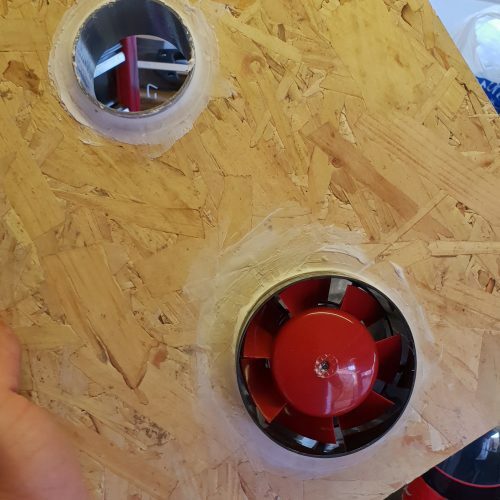 All I need to add is an exhaust vent since the air intake draws air directly from outside (since the shed gets very hot in the summer) it also acts like a cooler as it draws air over the water into the chamber. 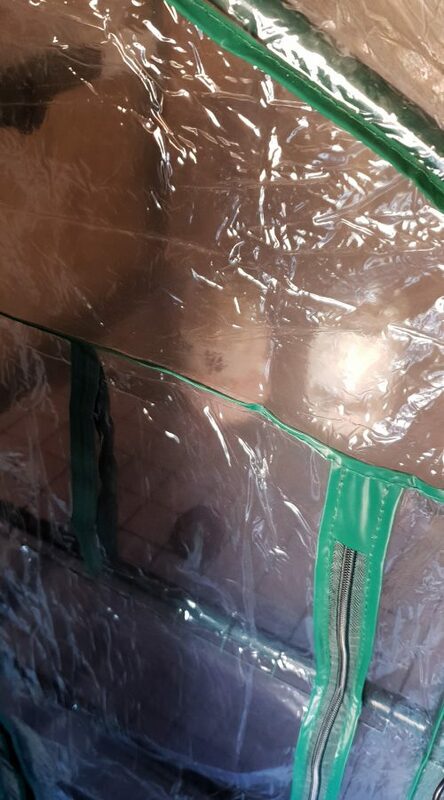 If you’ve got any questions or ways I could improve my humidifier, please let me know!